Camping Anastasia State Park was a real treat. The campground is well-kept, quiet & shaded just a short walk or bike from the beach. This is a, “full service,” campground. What I mean by, “full service,” is that every campsite has running water, electricity & picnic table and there are easily accessible restrooms, locking shower stalls, a dishwashing station & laundry facilities. Downsides: The campsites, themselves, were on the small side & some seemed to be right on top of each other. Also, we’re talking Florida right near the beach – So, expect a lot of sand. Florida’s Anastasia State Park has been permanently added to our searchable campground listings, where you can view more photos & information, click here & check it out! Like I said above, this is a Full Service Campground. You’ll find restrooms, including locking shower stalls, within walking distance of your camp. I found the facilities to be clean, during my stay. The dishwashing station & laundry facilities are also located at the restrooms. The washer & dryer cost about $1.25-$1.50 per load. All the sites have running water/electricity, picnic table, fire ring & grill. At the ranger station, you can find books in the, “Bedtime Story Camper Lending Library,” for campers aged four to nine. Outfitters, Anastasia Watersports, offers lessons & rentals of equipment (read more in Exploration below). 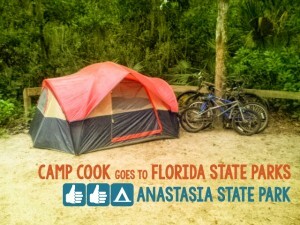 I am not sure if Florida State Parks treat Anastasia Campground with some sort of insect repellent or if the bugs are kept at bay by the constant breeze blowing in from the ocean. But, we visited in June and had zero bug encounters at this campground.. Well, except for one very large moth hiding out in the men’s restroom. While I did not have such an encounter, there were warnings (on Foursquare) of snakes hiding out under the boardwalks. Be aware that this is a possibility. We did have an encounter with an unknown critter who somehow got into our vehicle (without our knowledge) and let itself out in the middle of the night. Whatever it was, it raided a box of cereal bars leaving a trail from the car into the woods. It also ripped open a bag of sugar (for coffee) which it then left on the seats in smudged, unidentifiable tracks. Our best guess, is a raccoon. So, keep your eyes peeled & closely monitor car doors when unpacking gear. 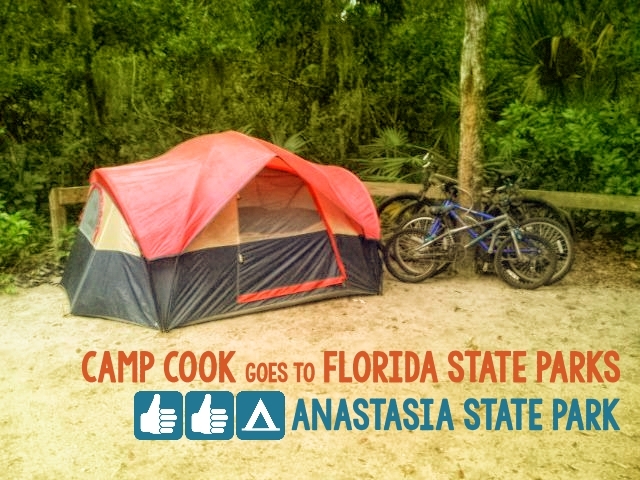 Read more of our experience in my Camp Cook Chronicles entry from Anastasia State Park. This I think is the best way to spend time with the whole family, camping. I’m sure my kids would love and enjoy it here. From running, biking to camping, it definitely is super fun!